When Merit Campbell is sent home from the mission field, wounded in an uprising at the Middle Eastern clinic he runs, he finds himself in Illinois. He ponders what is in store for him if he can’t stay in the field. Dealing with the details of his uncle’s enormous old house has been left to his sister; but since Merit is in the area, he’s interested in investigating the home where he had so many childhood memories before his parent’s and older brother’s deaths and the disappearance of his youngest brother, Justice. Amalia Kennedy is introduced to Merit by a mutual friend. She owns a company that deals with the client’s final wishes and estate details. She’s already agreed to help Merit’s sister sell the old house, but Merit decides to live there and turn it into a place for missionaries on leave. Amalia parents thought she’d marry her long time business associate, Hudson. Merit, a confirmed bachelor, and Amaila each find an attraction growing for the other. His ministry interrupts their relationship and tragedy finds them. Will they learn to trust each other enough to succeed? Ms Lickel writes a compelling story of two people who are struggling with their faith and where it has brought them. Amalia wonders if she’s doing enough and Merit wants to finish the job he started. The characters are believable and the story brims with love and hope. Lisa Lickel is a Wisconsin writer who lives with her husband in a hundred and sixty-year-old house built by a Great Lakes ship captain. Surrounded by books and dragons, she writes inspiring fiction, and is the author of the cozy mystery Buried Treasure series, mystery Meow Mayhem, the award-winning romance Meander Scar, A Summer in Oakville with Shellie Neumeier, Healing Grace and The Last Detail. She is a freelance feature writer for local news, writes short stories, magazine articles and radio theater. She is the editor in chief of Creative Wisconsin magazine and loves to encourage new authors. Lisa also is an avid book reviewer, a freelance editor, a writing mentor, a hostess at Clash of the Titles.com, and enjoys blogging at theBarnDoor.net and AuthurCulture.blogspot.com. 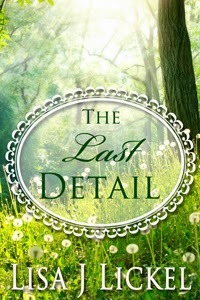 You may purchase The Last Detail on Amazon. What a great, concise review! I especially liked your analysis. Well done, Vicki and Lisa! Thank you for hosting me, Vicki. You're welcome Lisa. I enjoyed the book.